A recent study from Ohio State University found that 70% of adults over 50 are turning to some form of alternative medicine. Not surprisingly, the aches and pains of aging are the main reason that many older adults turn to alternative treatments such as massage, acupuncture, and meditation. However, medical professionals stress the importance of thoroughly researching alternative therapies and medicine before committing to treatment. 1. Acupuncture: Acupuncture has long been used as a way to treat pain. There is growing evidence that undergoing routine acupuncture not only treats pain, but also relieves stress and improves the immune system. 2. Herbal Medicine: An increasing number of older adults are using herbal medicine such as gingko to supplement their medication (though it should be noted that using herbal supplements if you are taking prescription medication can have an adverse effect and you should always let your doctor know about any alternative treatments you’re experimenting with). 3. Massage Therapy: Older adults suffering from persistent pain are increasingly turning to massage therapy as a way to relieve aches and pains. About 47 million Americans, most of them over the age of 60, have been using massage therapy as a way to improve circulation and even alleviate the symptoms of depression. 4. Chiropractic: Chiropractors reported that 14% of the patients they see are over the age of 65, most of them for treatment of chronic lower back pain and conditions of the joints. 5. Meditation: As we get older, our cognitive abilities start to decline. It has been found that yoga and other forms of meditation can significantly improve the cognitive ability of those over the age of 55. 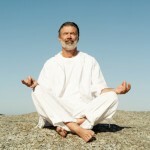 Many adults over the age of 50 reported that they use breathing exercises as a form of alternative therapy and to relax. Conventional medicine doesn’t always provide relief and that’s why you find people who have tried the traditional route finally turning to alternative medicine. However, taking alternative medicine should not be a substitute for taking the medicine your doctor prescribes—rather, it can complement traditional medicine. “Around 70 Per Cent of Older Adults Use Alternative Medicine,” Tele Management web site; http://www.tele-management.ca/2013/08/around-70-per-cent-of-older-adults-use-alternative-medicine/, last accessed August 15, 2013. Lafferty, W. E., et al., “Insurance coverage and subsequent utilization of complementary and alternative medical (CAM) providers,” The American Journal of Managed Care 2013; 12(7): 397. Gilbert, M., “Older Americans are opting for massage to soothe away aches & pains,” Hearld Mail, February 4, 2011; http://articles.herald-mail.com/2011-02-04/lifestyle/27104347_1_massage-therapist-amta-american-massage-therapy-association, last accessed August 22, 2013. Prakash, R., et al., “Long-term concentrative meditation and cognitive performance among adults,” Neuropsychol Dev Cogn B Aging Neuropsychol Cogn 2012; 19(4): 479-494.